I have had an incredibly busy week and so apologies for my lack of blog posts in the last few days. Have been out all day with Molly, getting some necessary bits and pieces for the house. I'm looking forward to a couple of weeks off come next Friday, and I am making a 'Bucket List' of recipes I want to try during my time off, so stay tuned! Tonight I want to share with you these baby Converse I made during the week. 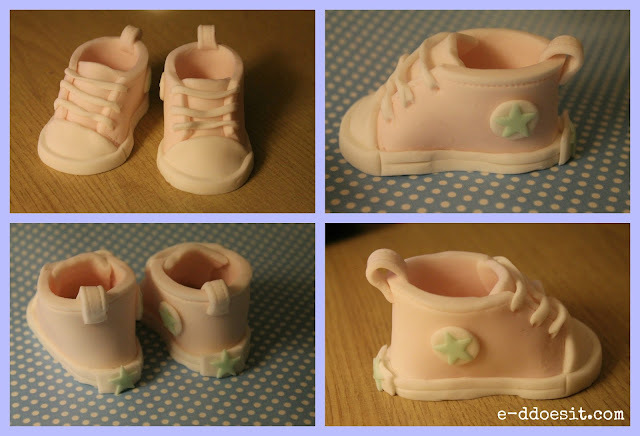 These little Converse boots are perfect for babies birthdays, christenings or baby showers. The great thing is these little shoes are made using a template, so you can't go too far wrong! 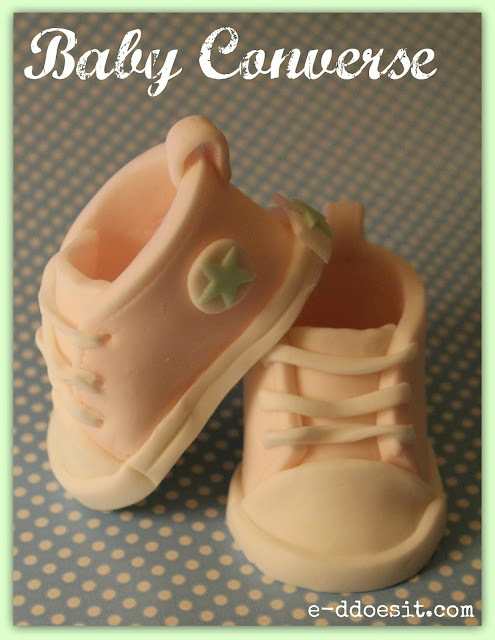 So for those not too confident at modelling babies, or other cake toppers, this shoe template is the perfect solution! Below is the template I used to cut out the components of the shoe. 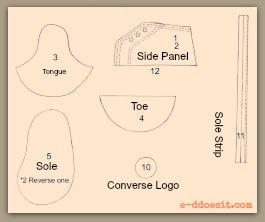 This template is obviously for one shoe, so to make a pair, you will need to use it twice. You will also need to make two side panels for each shoe. To print this template off you will need to enlarge it before printing. I found it easier when I printed it onto card. I then laminated the card so it was easy to clean and can be re-used, but it works perfectly well with cereal box card! roll out icing easier to model and it will dry harder and quicker. it pink, green, blue etc. This is a link to a YouTube tutorial I found on 'How to Assemble the Converse'. There may be a slight variation in decoration and the template used, but it gives a good indication on how to get started. or Nike runners by changing the logo on the side. instead of a cutting wheel etc. otherwise it will dry out (very quickly) and will be useless. 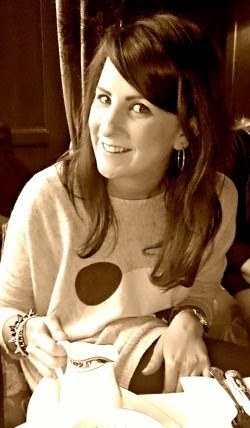 - If you have any questions or queries be sure to send me an email or leave me a comment. Really, I love your job, it's amazing, everything you cook it's a sweet surprise, thanks for share it!! !